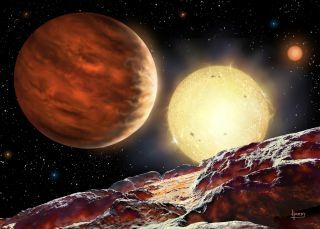 This artist's impression depicts Tom Wagg's planet, WASP-142b, in orbit around its star, WASP-142. An English high school student has become perhaps the youngest person ever to discover an alien planet. Fifteen-year-old Tom Wagg first detected the gas-giant exoplanet two years ago, while doing work-experience study at Keele University in England. Further observations have now confirmed the existence of the alien world, which lies about 1,000 light-years from Earth and is known as WASP-142b. "I'm hugely excited to have a found a new planet, and I'm very impressed that we can find them so far away," Wagg, now 17, said in statement. High school student Tom Wagg spotted a Jupiter-size exoplanet two years ago, at the age of 15. Wagg analyzed data gathered by the Wide Angle Search for Planets (WASP) project, looking for tiny dips in stars' brightness caused by planets passing in front of them. This strategy, known as the transit method, is the same one used by NASA's Kepler spacecraft, which has discovered more than half of the roughly 1,900 known exoplanets to date. WASP-142b is a "hot Jupiter." It's about the same size as our solar system's largest planet but lies extremely close to its host star, completing one orbit every two days, researchers said. Scientists think hot Jupiters form relatively far from their parent stars, then migrate inward over time as the result of gravitational interactions with other planets. So the WASP-142 system likely harbors worlds that have eluded detection thus far, researchers said. Wagg, a student at the Newcastle-under-Lyme School in the English county of Staffordshire, plans to study physics when he attends university. He asked to participate in the work-study program at Keele after learning that the university hosts a research group focused on exoplanets. "Tom is keen to learn about science, so it was easy to train him to look for planets," Coel Hellier, who heads Keele's WASP project, said in the same statement. Wagg's detection of WASP-142b was confirmed by astronomers based at the University of Geneva in Switzerland and the University of Liege in Belgium, researchers said.